Location. 40° 19.478′ N, 76° 46.816′ W. Marker is in Harrisburg, Pennsylvania, in Dauphin County. Marker is on U.S. 22 William Penn Highway 0.1 miles east of Blue Ribbon Ave., on the right when traveling east. Touch for map. Marker is in this post office area: Harrisburg PA 17112, United States of America. Touch for directions. Other nearby markers. At least 8 other markers are within 5 miles of this marker, measured as the crow flies. Barnett's Fort (approx. 2 miles away); Patton's Fort (approx. 2.3 miles away); Union Canal (approx. 3.7 miles away); Lincoln Cemetery (approx. 4.6 miles away); Ralph W. Abele (approx. 4.9 miles away); Pennsylvania Fish and Boat Commission (approx. 4.9 miles away); William Maclay, Esq. (approx. 5 miles away); John Harris, Jr. (approx. 5 miles away). Touch for a list and map of all markers in Harrisburg. More. 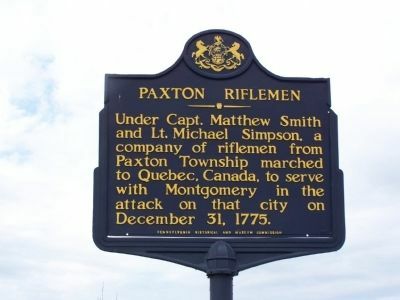 Search the internet for Paxton Riflemen. Credits. This page was last revised on June 16, 2016. This page originally submitted on April 15, 2008, by Bill Pfingsten of Bel Air, Maryland. This page has been viewed 1,581 times since then and 17 times this year. Photo 1. submitted on April 15, 2008, by Bill Pfingsten of Bel Air, Maryland.